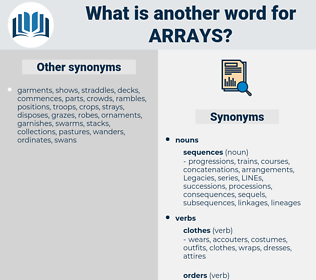 What is another word for arrays? combinations, agreements, datasets, assembles, patterns, clusters, understandings, boards, alternatives, hatchways, groupings, assemblages, collections, channels, masters, systems, GRIDS, microchips, Assemblies, root-causes, stacks, Templates, preparations, charts, rulesets, panels, billboards, tiers, complexes, frameworks, tabulations, wards, roots, Adjustments, zonesets, networks, rows, packages, Chips, heaps, rings, markers, tables, paintings, masses, pictures, routers, stack, Entries, exhibits, ensembles, boulders, plates, cabs, suites, pools, mosaics, bands, baskets, reefs, estates, Schedules, disks, pads, tags, panes, streets, Las, drums, packs, Patches, AMAS, signposts, Parents, Fleas, sets, Boxes, piles, chunks, cabins, kits, blocs, shields, blocks, compromises, sheets, deals, signs, LUMPS, webs, Clumps, Drives, bugs, booths, bullets, DISCS, slides, fixes, units, mounds, LINEs, Dies. 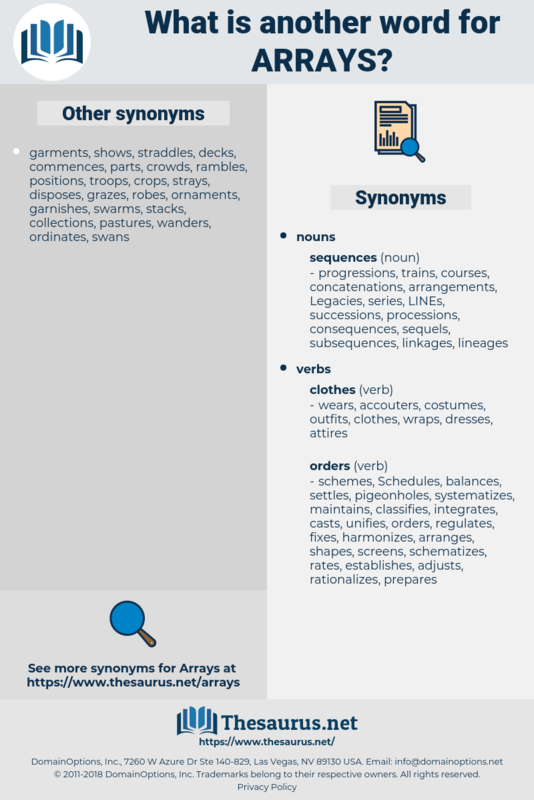 aire, airway, aar, aruru, ayr, area, aware, aweary, aery, arere, aare, awry, aria, arrow, areaway, are, air, ahura, ara, aurora, ar, arui, airy, aura, arroyo, aerie.